Spanish For Social Change: work to rule: huelga de celo? 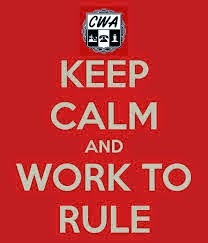 work to rule: huelga de celo? A work slowdown is an operación tortuga, but how would you translate a "work-to-rule" action? Huelga de celo? Trabajar a reglamento? Trabajar a la letra de la descripción de trabajo? I like huelga de celo but I'm not sure how widely it would be understood outside of Spain. This is not as common a job action in most of Latin America as it is in the US and Canada. Labour actions are on my mind because I am being legally ordered by the administration of York University to cross the TA picket line next week. I will not be crossing. I've posted more about the strike on my other blog. Thanks to Manuel Cedeño for pointing out that huelga de celo is listed in the Vox dictionary as being used only in Spain. Has anyone heard it used anywhere else?